Muscle Magik is ALL NATURAL and is often used instead of drugs and other synthetic, unhealthy pain killers. Plus, Muscle Magic actually promotes HEALING, unlike other unnatural products that simply block pain and temporarily relieve inflammation in one area, but cause it elsewhere, i.e. in the liver and stomach. The 100% pure plant oils used in Muscle Magik are well known* for their analgesic, anti-inflammatory and anti-spasmodic properties that can relieve pain and inflammation while calming spasms and muscle cramps. This proprietary blend uses the natural oils from peppermint, clove, lemon grass, wintergreen, spruce, marjoram, douglas fir and black pepper. Please read HOW TO USE THIS OIL before using it. *Please check out our disclaimer. 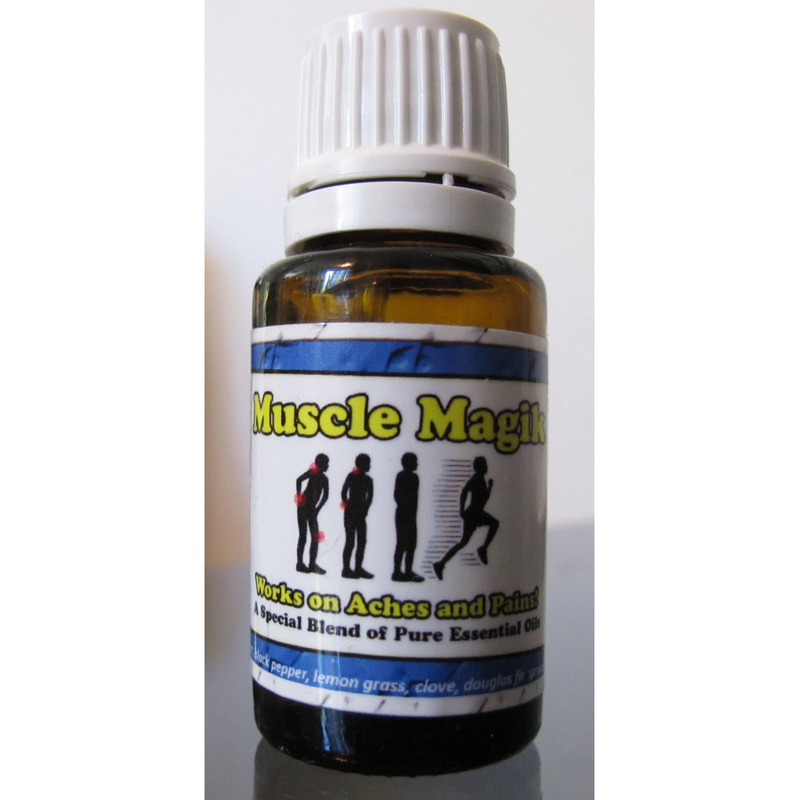 Muscle Magik started as a blend of very different oils from what it is now. Over the years of trial and error with myself and the feedback from many clients, I finally have created the perfect blend, 10 years later! The blend consists of a special ratio of peppermint, wintergreen, black pepper, marjoram, clove, spruce, lemon grass and douglas fir. It is considered the perfect blend by many because the ratio and choice of the oils in Muscle Magik cause it to penetrate deep into the muscles, while leaving a superficial heat across the surface that eases aches and pains. This perfect blend went through many different trials however. At first it didn’t have enough heat, i.e. black pepper and peppermint oil, next it didn’t penetrate deep enough, and then it had too much heat, OUCH. After a lot of feedback from clients and friends, Muscle Magik has morphed into an oil that works extremely well for people who like to feel their painful and achy muscles heat up from deep within and then feel the warmth rise to the surface. ARE ESSENTIAL OILS SAFE? Yes, but these precautions are necessary to take. Muscle Magik was never intended to be mass produced or sold anywhere besides my office, but after all of the favorable feedback and incredible stories of it helping people and getting them to switch from pain medication to Muscle Magik, I decided it would be best for everyone if this oil was accessible online and at stores. That is the main goal for Muscle Magik – to introduce holistic and natural ways of healing and pain management for the general population to promote optimum health. Check out the most FAQ’s. I hope you will enjoy Muscle Magik and benefit as much as everyone else has on their way to finding all natural ways to manage aches, pains and health. * Unfortunately, the FDA and government agencies have not approved these findings yet, due to insufficient, large double blind studies – read more about the science of these oils here. Therefore, we will rely on our AMAZING TESTIMONIALS (stay tuned for the collection) to tell you what these oils have done for people and what they could do for you.